A tooth that has received a root canal treatment with poor results can be saved with a surgery called apicoectomy. An incision is made in the gum tissue to expose the bone and surrounding inflamed tissue. The damaged tissue is removed along with the end of the root tip. 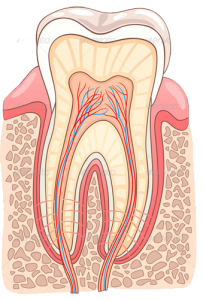 If necessary, a root-end filling is placed to prevent re-infection of the root and the gum is sutured. The bone naturally heals around the root over a period of months restoring full function. An apicoectomy is usually a permanent solution for long term life of a tooth. The most common risk is that the procedure fails and the tooth needs to be extracted. However, should you decide to forgo such a surgery, then the only alternative is to remove the tooth. You may then consider the replacement of the lost tooth by an implant-supported crown, which in most cases happens to be the choice solution.